With the holiday season behind me, and January flying by, I feel a little out of step. All those lists and plans from December, many of which were abandoned while Portland rested under a blanket of snow, were gladly set aside in favor of a more organic holiday schedule inspired by our wonderfully white Christmas. But now that we are back to ordinary weather and ordinary time I feel the need to reestablish a certain amount of predictable order in my schedule as well. As we slide into mid January it feels past time to get myself together and find my groove in the kitchen again. My family is back to a regular weekly routine of work and school and I am eager to feel planned and organized, to know what’s for dinner before I start preparing it and to have the ingredients on hand. When I have the time, and presence of mind, to plan ahead and shop, my slow cooker is one of my best winter friends. A meal started in the morning and allowed to simmer makes the house smell great and welcomes my family home in the afternoon with the promise of a hot and satisfying dinner. It’s a great way to prepare a hearty meal with a minimum of fuss and can confidently and nutritiously feed a family on a busy weeknight. Sometimes though, maybe often, I am just not that organized. I want a hot nutritious dinner that is easy to prepare but I just don’t have what I need to get it started in my Crockpot in the morning or I forget to put it on until I have left the house for the day. Here is a great meat and potatoes dinner for those days when I am out of the house for the day before I think about what's for dinner. This is a meal I can put togther quickly when I get home and yet presents itself as if I had a plan all along and invested some significant effort to prepare. What's the trick? An oven cooking bag. It is the opposite of a slow cooker in that it allows a roast to cook quickly and evenly in the oven, while the meat remains juicy and flavorful. This recipe is perfect for family dinners or even for entertaining guests. It is a complete meal you can shop for on the way home, put together in about fifteen minutes and have on the table in under an hour. It is also easy on clean up since it is all cooked on one pan. Shake the flour inside a large oven cooking bag. 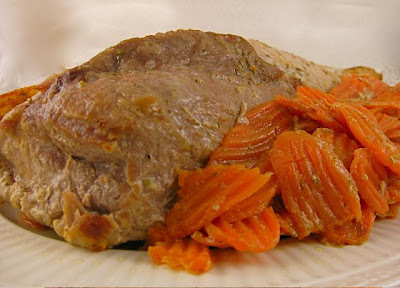 Place the pork tenderloin and carrots inside the bag. In a small bowl or measuring cup combine the maple syrup, 2 Tablespoons of olive oil, I teaspoon of dried rosemary and the ground black pepper. Pour this in the bag over the pork and carrots. Close the bag using the tie provided. Turn the bag several times to evenly coat the contents with the sauce. Arrange the bag to one side on a baking sheet or shallow roasting pan. Cut six ½ inch slits in the top of the bag. Place the steak fries in a gallon size Ziploc bag. Add the remaining 2 tablespoons of olive oil and 1 teaspooon of dried rosemary to the bag. Seal the bag and shake vigorously to evenly distribute the oil and seasoning. 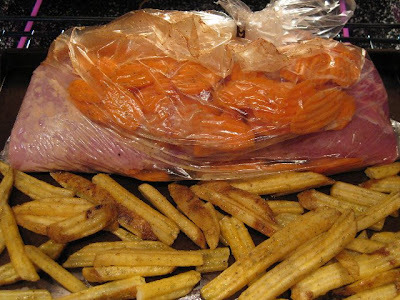 Place the coated steak fries in a single layer on the pan next to the cooking bag. Place the pan in the oven and roast for 35 – 45 minutes or until a thermometer inserted in the thickest part of the roast registers 155 degrees. Remove the pan from the oven. 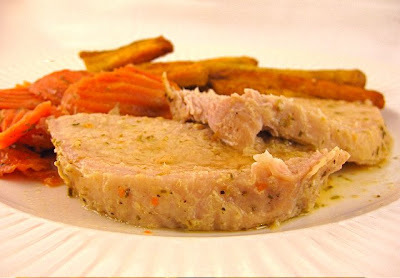 Carefully remove the pork and carrots to a serving tray then tent them with foil and allow to rest for approximately 10 minutes. Season with salt and pepper if desired. Slice and serve with pan juices. Note: I cooked a larger pork loin than was called for in the recipe. I wanted to have some leftover meat for barbecue sandwiches. Naturally it took a little longer for the larger roast to cook to the desired temperature but the pork did turn out as I had hoped. My potatoes, however, turned out a little crispier than desired. If you cook a larger roast than specified in the recipe just be mindful to allow a bit more time and to remove the potatoes from the pan when they have browned as desired. When storing the leftover pork roast place it in a Ziploc bag. Pour juices from the oven cooking bag over the meat and seal the Ziploc bag pushing as much air out of it as possible. Save in the refrigerator to make Pulled Pork over Brown Rice or Pulled Pork Barbecue Sandwiches. If you don't plan to use the pork in the next day or so, label it and place it in the freezer for later use. Looks delicious and simple to make. Rosemary is on my top ten herb list for sure! Cooking bags have slipped off the radar around here so thanks for the reminder of how great they are. This meat and potatoes meal looks so delicious. i need to start using maple syrup on more than just pancakes, and a little pig is a good place to start--this is fantastic. OH MY! I just made pork loin with dijon cream sauce and it was delicious. But your maple glazed recipe sound fantastic!! Ever try handmade soap? Imagine a soap with a creamy lather, a delightful aroma, and enhanced with natural herbs. Scandia Spa offers the perfect soap for your daily use. We have a large selection of both soaps made with essential oils and soaps made with scent. Not sure where to start? Our Aromatherapy Soaps are made with real essential oils. Fruity & More soaps are made with high quality fragrances. We also carry a full line of Bath Accessories. Create the ultimate package by combining handmade soap, bath salts, lotions, and bath accessories!